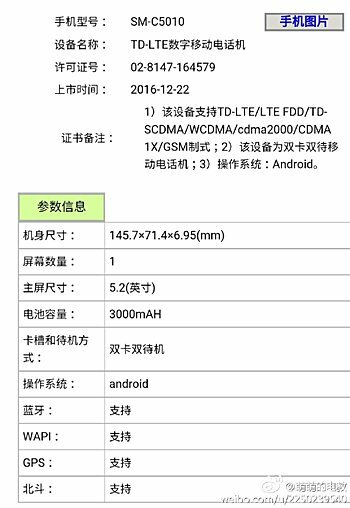 After the Samsung Galaxy C7 Pro, the Galaxy C5 Pro (SM-C5010) has also been certified by TENAA, the Chinese regulatory authority. Spec-wise, the device is powered by Snapdragon 626 SoC, and sports a 5.2-inch full HD display. RAM is 4GB, while internal memory is 64GB. In terms of camera, the phone features a 16MP/16MP camera combo. Measuring 145.7x71.4x6.95mm, the handset packs in a 3,000mAh battery. It runs Android 6.0.1 Marshmallow out of the box. Both Galaxy C5 Pro and C7 Pro have been the subject of rumors and leaks for quite some time now, you can read more about them here.